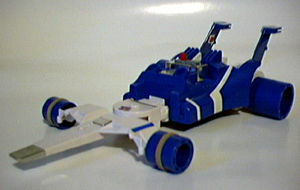 This is the Time Machine 2, designed for the blue Timanic figure. His body can be attached to various parts of the roadster or he can be seated on it as well. 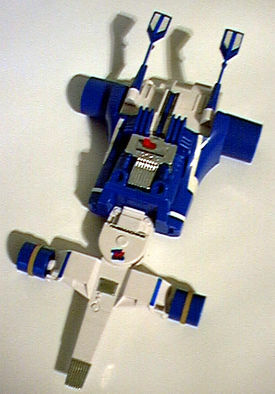 If he's attached to it, the powered vehicle will also light up the head of the Timanic figure! The interchangeability of the car and figure are similar to that of some of the Microman Titans... wonder which team of designers had the idea first.